Marian House is a non-profit organization founded in 1982 by the Sisters of Mercy and the School Sisters of Notre Dame. Marian House is a holistic, healing community for women and their families who are in need of housing and support services. It provides a secure, supportive environment for women who are moving from dependence to independence. Visit the Marian House website. SisterHouse is a sponsored ministry of the School Sisters of Notre Dame. 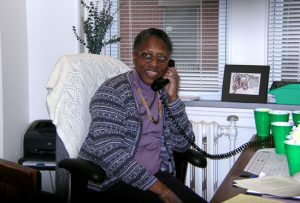 The organization opened its doors in 1982 in response to an expressed need for a short-term home for women leaving prison. Over the years, it has evolved and offers women in recovery programs a temporary home in a faith-oriented community. At SisterHouse, women are encouraged, supported and assisted in becoming productive members of society. Visit the SisterHouse website. Theresa Living Center, a residential transitional home for women with or without children, and Caroline Family Services, a scattered site transitional housing program for women and children, exist for women who dare to change their attitudes and behaviors to approach a healthier life. Theresa Living Center and Caroline Family services are founded on the belief that the right environment can make the difference for women striving to reclaim their personal worth and dignity. These services began in 1987. Visit the Theresa Living Center website.